Kyna has a deep-seated (and well-earned) fear of the water. So when her adoptive parents announce that they have rented a summer house on Lake Champlain, she begs to be left behind for the summer. Alas, this is not possible. Yet even at the lake Kyna does her best to avoid the water, exploring instead the forests and hillsides, documenting them with her camera. But when her new friend, Tylo, draws her into his quest for strange water creatures, Kyna finds herself pulled into unexpected discoveries – not only about the lake, but about her own strange heritage. 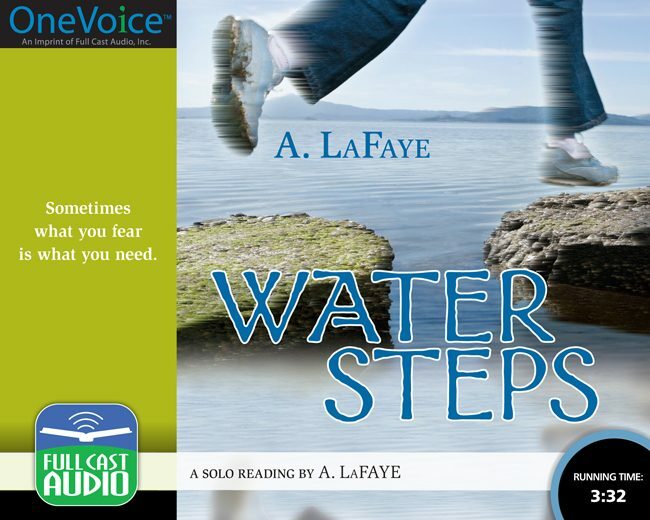 A novel that pulses with a passion for nature and the natural world, Water Steps is rich with love and loss, longing and renewal, a bit of mystery and a touch of fantasy. With an extraordinary gift for dialect, author A. LaFaye brings its rhythms to vivid life in this haunting reading.